The Coalition for a Stronger Tree Ordinance is working to update Seattle’s current Tree Protection Ordinance. Some 32 organizations have joined our effort so far and we would welcome you also joining us. The Coalition has agreed to a number of items we feel need to be addressed in an updated tree ordinance. We are asking groups to review the letter and if you agree, forward it to the Mayor and City Council, signing on behalf of your organization. Councilmember Rob Johnson is intending to release a draft in the next several weeks and we need organizations to respond now. We urge you to provide strong leadership now to significantly strengthen Seattle’s tree ordinance to protect our trees and urban forest. Seattle’s urban forest is an integral and vital part of our city. It provides many benefits and amenities to those living in our city. Trees help clean our air and enhance public health, reduce stormwater runoff, mitigate climate change, decrease the impacts of heat and wind, provide habitat for birds and wildlife and give us a connection with nature in our neighborhoods. Seattle’s rapid growth is reducing these beneficial impacts as trees are removed, particularly during development across our city. It is urgent that you act now to stop the loss of trees, particularly exceptional trees and tree groves, and to promote environmental equity as we increase our tree canopy. Adopt a policy of a net increase of Seattle’s tree canopy each year to reach the city’s current goal of 30% tree canopy. This requires maintaining and strengthening current protections for both significant and exceptional trees, tree groves, Heritage trees, environmentally critical areas and natural areas. Require the replacement of all trees removed that are 6” DBH and larger with equivalent sized trees (e.g. small, medium or large) – either on site: or pay the replacement and maintenance mitigation costs into a City Tree Replacement and Maintenance Fund. Allow the Fund to accept fines, donations, grants and for acquiring land and setting easements and Tree Protection Trusts. Expand the existing tree removal and replacement permit, 2-week notice and posting system used by SDOT – to cover all public and private trees 6” DBH and larger on both public and private property in all land use zones. Allow removal of no more than 1 significant non-exceptional tree per lot per year. Establish one citywide database when applying for tree removal and replacement permits and to track changes in the tree canopy. Post online all permit requests and permit approvals for public viewing. Expand SDOT’s existing tree map to include all the trees in the city that are removed and replaced. Require a detailed Urban Forest Canopy Assessment for all development projects prior to any development beginning. This detailed tree inventory should be entered into a public database. Replacement trees should be based on equivalent tree size at maturity. Expand SDOT’s existing tree service provider’s registration and certification to include all tree service providers working on trees in Seattle. Consolidate tree oversight into one city entity: The Office of Sustainability and Environment, as was recommended by the Seattle City Auditor in 2009. Give OSE the additional authority needed to ensure that trees have an independent advocate for their protection to avoid conflicting goals in other city departments. Emphasize native trees and vegetation, particularly conifers, to maximize sustainability and environmental services. Require the removal of invasive plants during development. Increase incentives for protecting trees and provide public assistance for property owners who need help complying with the city ordinance. To increase compliance increase penalties, fines and enforcement. Ensure environmental equity in maintaining and increasing our tree canopy across the city. 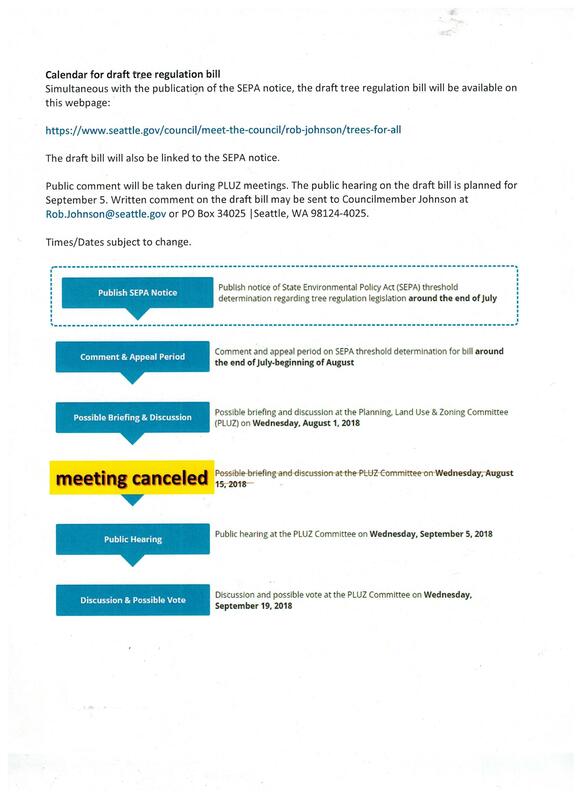 Note: Above is the final version of the Letter to the Mayor and City Council that organizations are being asked to sign onto as part of the citywide coordinated effort to show strong support for updating Seattle’s existing Tree Protection legislation. In the current proposal as outlined by Council staff on May 16, 2018, Councilmember Johnson, is not proposing to require developers to replace most trees lost during development while requiring homeowners to replace all trees larger than 12 inches DBH. Yet development is where most trees are being lost. Everyone needs to be treated the same, not letting developers evade most mitigation for trees lost. Also the threshold needs to be 6″ DBH, not 12″ DBH, which would only cover 18% of the trees on single family lots. Seattle appears to have not consistently complied with SMC 25.11.090 requiring developers to replace all trees greater than 24 inches DBH and exceptional trees cut down during development. There is no database we can find of trees removed and replaced by the city under 25.11.090. There is no mention of a requirement for developers to comply with this position on the city’s website or in their handouts and no mention of fees required by developers to pay the city to replant trees developers removed. The city needs to strongly enforce the current provision and strengthen it. See UFC letter below. Please copy and paste the letter text above the note and include it in an email you send to the Mayor and Seattle City Council in support of updating Seattle’s Tree Protection Ordinance. They need to hear from you. Be sure to add your own concern about developers needing to comply with the current ordinance provision SMC 25.11.090 and seemingly being exempt in the proposed ordinance update that homeowners would have to comply with. Urge that the city start at 6 inches DBH for requiring replacement which would cover 45% of the trees in single family zones. Developers and homeowners should be treated the same. Our suggestion is that you also state that you support the recommendations as made by the Seattle Urban Forestry Commission (see below) and discuss the specific concerns of your neighborhood or organization. When your organization signs on to the letter above please send notification as a bcc to Steve@friends.urbanforests.org along with the person signing for the organization and their position. We will post letters from organizations on the friends.urbanforests.org website to document the concerns of individual organizations. If you need someone to speak to your organization regarding this issue please let me know and we’ll get someone to come. More information – we try to post as much as we can n www.friends.urbanforests.org for reference and also post news on Friends of Seattle’s Urban Forest Facebook page.